Yay, Perth!!! I was so excited when my plane landed... After more than 2 years I would finally see Shani and her family again. It felt to good to arrive and actually have someone waiting for me at the airport. How many times did I arrive at airports seeing all the people being welcomed by loved ones with smiles, hugs and kisses... and the only people smiling at me were the taxi drivers trying to get me into their cab :-(. But this time it was different :-)!! So there they were standing, waiting for me :-). Well, I didn't find Brisbane too exciting. It's just a city like all the other australian cities... It has modern buildings, a river and a skyline you can see from the other side of the river. And I was too excited to enjoy it because I couldn't wait to go to Perth the next day and finally see Shani and her family again (my best friend from South Africa who now moved to Australia with her family). Noosa is a posh holiday destination... beautiful villas everywhere. What I liked most was the walk through the national park to teh Noosa Heads. I walked for hours along the ocean, saw a cute koala and a beautiful sunset. Early in the morning, I was picked up by a 4x4 bus for my 2 day Fraser Island Tour. People say Fraser Island the biggest sand island in the world (123km x 22km). When we drove onto the ferry, we could not even see where we were going... Fraser Island, which is just a few meters across the ocean from Rainbow Beach, disappeared in the fog. Luckily the fog disappeared as quickly as it has come and a few minutes after leaving the ferry, we could see the ocean literally right next to our bus windows. Our 4x4 bus was driving on the beach through the sand and some smaller waves. That was a fun start of a great trip. I met two lovely young teachers: Helena from Canada (working as a teacher in Indonesia) and Jen from Irland. We got along very well and spent the rest of the time on this trip together. On our first day we did some walks through the semi-tropical rainforest, walked through Eli Creek, saw coloured sand rocks, walked to a lookout, saw a shipwreck on the beach during sunset. In a Beach Resort we were spoilt with amazing lunch-, dinner- and breakfast buffets. Wow, haven't had such great food for ages. The second day of our trip started with a swim in the cristal clear but freezing cold Lake McKenzie with a beautiful white sand beach. After another great lunch buffet we went to the Hammerstone sandblow and Lake Wabby, where we had a blast running down the sand dune jumping into the green lake. 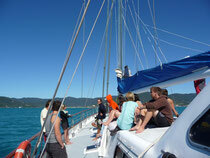 From Airlie Beach I started my 3 day/3night sailing trip to the Whitsunday Islands and the outer Great Barrier Reef. It was so awesome. With 32 guests and 7 crew members we lived on our 30m yacht. We enjoyed the beautiful Whitehaven beach and the amazing blue and green colours of the water, were sunbathing on deck, watched beautiful sunsets and moonrise, did lots of snorkeling and felt like swimming in an aquarium... One day a whale was swimming right next to our boat and on my dive I could even hear him singing. An amazing experience. And not to forget our after-party in Airlie Beach. We had great fun. Magnetic Island was really cool. Not too touristy, lots of beautiful pristine beaches, nice lookouts and great bushwalks. On one walk I saw my first wild koalas. They are soooo cute! One of them even had a little baby... oooooh I would have loved to cuddle them. And I also saw my first kangaroos :-), okay they were wallabies, but still so funny to see them jumping around. Now I feel like really being in Australia. As all hostels were booked out for this night on Magnetic Island, I decided to have a quick stop in Mission Beach then before going to Magnetic Island. I enjoyed it, because there were not too many tourists around. I had a long walk along the long long sandy beach and saw skydivers landing here, did some bushwalks and just relaxed. Together with the girls I met in Port Douglas (Alison from Melbourne, Rio from England and Marijon from the Netherlands) I continued my trip to Cape Tribulation. On our way we stopped at some beautiful lookouts, went through the rainforest in Mossman Gorge and did another rainforest boardwalk near Cape Tribulation, went to a Wildlife sanctuary where we saw lots of saltwater crocodiles and kangaroos and then arrived in Cape Tribulation where the rainforest meets the ocean. A terrific beach which reminded me of the movie "The Beach". The only downside of this beach was that you shouldn't swim in the ocean because there is a risk of crocs to be around. I wasn't keen on being eaten by a crocodile. We did some more rainforest walks, one nightwalk with torches through the rainforest and I hiked up Mount Sorrow with Alison. This hike took us 6 hours... 4 hours of uphill and then 2 downhill through the rainforest crawling under and climbing over treetrunks in a heat of more than 30C and a humidity which was just increadible...tough walk. When reaching the top we had the worst view you could ever have... there was fog everywhere and all you could see was fog^^. But well, the hike was still fun :-). After 2 nights at Cape Tribulation it was time to head back to Cairns. On our way we stopped for a crocodile cruise on the Daintree river. Port Douglas is more a holiday destination for the rich and famous... so that's were I needed to go ;-). Well, it was quite expensive there but a backpacker always finds a way of living a cheap life. There were more local tourists and families, but finally no more backpacker party kids and a beachtown with a nice beach and not only a swimming pool. So here I felt a lot more comfortable and met some nice girls of my age as well. Well, another thing I really don't like here is the fact that I feel I don't fit here. The city is full of backpackers so it's hard to find any locals and the average backpacker is between 19 and 20 years old, just graduated from school, first time away from home and partying all night. I've got the feeling the girls have a contest going on who has the shortest skirt and the guys are trying to beat each other in getting the most of girls for a night or being the most drunk.... Oh friends, I start feeling old ;-). Well, no worries I still had a great time here. I just stayed away from the party kids, relaxed and enjoyed the sunshine and 28C. And then there was my diving trip on the Great Barrier Reef... the reason why I actually came to Cairns. I was a bit nervous, because it has been more than 2 years now that I haven't been diving. But as soon as I jumped in the water, I felt like it has been yesterday. I felt so comfortable under the water that I could enjoy every second of the dive. I was lucky as on my dive boat we were only two certified divers and the other one couldn't equalize so that I ended up having my private dive master with me during both of the dives. The coral of the Great Barrier Reef is so amazing... coral in any colour and shape you can imagine. Wow! I saw a few big fat napoleon wrasses, a big green turtle, a white tip reef shark (ca 2m), big blue giant clams, clown fish and lots and lots of other beautiful fishes. During the second dive we were also diving through different caves and overhangs which was good fun. I felt so happy to finally dive again. Sydney is a great city. The Sydney Opera House in its beautiful setting in Sydney Harbour with the Harbour Bridge in the background makes this city something very special. The Royal Botanical Gardens are the prettiest gardens I've ever seen in a city. I had a good night out in Kings Cross, a lovely walk along the beaches and cliffs around Bondi Beach, a stroll through some nice streetmarkets and had some nice food in Chinatown. I also enjoyed two nights in a nice hotel when my friend Simonne from Melbourne came to visit me in Sydney for the weekend. I met her in Ecuador and travelled with her for 3 weeks through Ecuador. So it was great seeing her again. And today a friend from home (Sonja from Erkelenz) arrived and is coincideltly in Sydney at the same time as me. So with her I'll spend my last days in Sydney and on Tuesday I've got my flight to Cairns...escaping from the neverending rain here in Sydney, hoping to find some sunshine. Australia- here I am!!! I'm DownUnder... I cannot believe it. I suffered from quite a culture shock, after spending nearly 5 months in South America. All of a sudden, everyone speaks English around me, traffic is on the left side of the road, the whole city is full of tourists (most being between 18 and 20 years only), hyper modern buildings full of shops and banks, when walking on the street noone knows that I'm a tourist because people are looking just like me, and all of a sudden I am allowed to flush toilet paper in the toilet (in South America you always had to throw it in the bin). Amazing. It was so unreal in the beginning... I couldn't believe that all of a sudden I'm in Australia. The moment when I stood on Sydney harbour, looking at the Sydney Opera House and the Harbour Bridge, I could finally realize it. I'm really in Australia now... A great feeling. Oh, I nearly forgot already that I was nearly sent off the country before even entering it... I didn't realize that I needed a visa to enter Australia... I was so convinced that I would just fill in the immigration form on the airplane to Australia, like you can do it when you fly to the USA, South America or wherever. But well, I was wrong and didn't have a visa. They said the airline normally would have had to check if I had a visa and would not have been allowed to board me onto the plane when noticing that I didn't have one. Luckily they must have ignored the warning which popped up on their screen, but now here I was... sitting at the immigration office in Sydney airport, waiting for half an hour worrying if they would decide to give me a visa or not. Oh man, luckily they were generous in the end and gave me my stamp in the passport. The next surprise came when I opened my luggage at the quarantine check (they are going crazy because of the swine flu on all airports), I had to realize that my shampoo opened and my whole backpack was full of shampoo... Oh my dear, what a mess. But well, luckily that was where my bad luck ended.